College students today are swamped with social calendars, budgeting nightmares, job searching, party planning, sports, study abroad, food shopping, and of course, studying. On top of everything, students need to stay extremely organized if they want to keep up with classes and maintain a little sanity. Our list of 35 best free iphone apps for college students can help you do it all, including reviewing for tests, storing your notes, sharing grocery lists with roommates, staying healthy, mixing drinks, getting a date and graduating on time. If you like other more iphone apps then you explore our iphone gallery, where you will find a large collection of iphone apps. 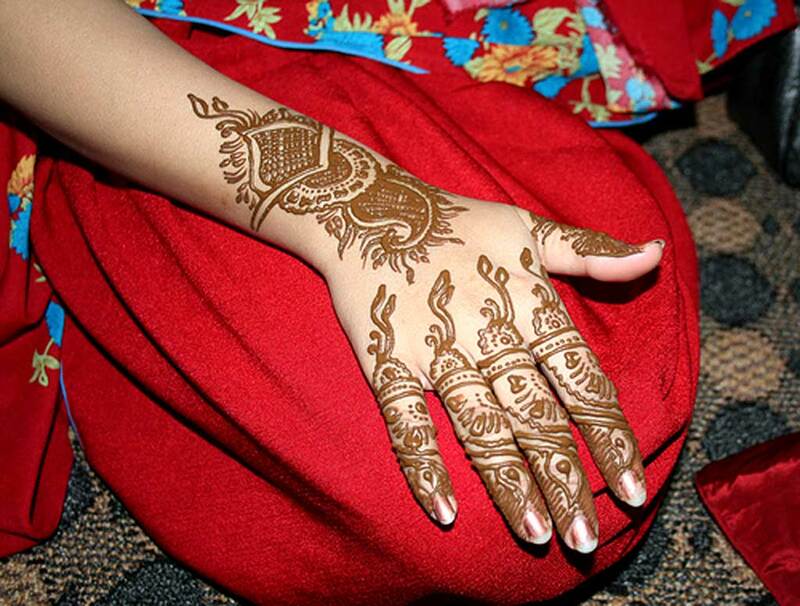 I hope you will like these apps. 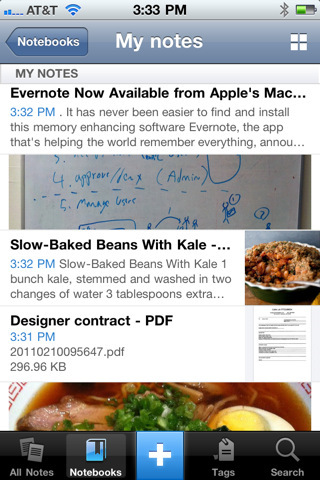 This app can be run on Mac or Windows, and you can sync multiple computers with EasyTask on your iPhone. 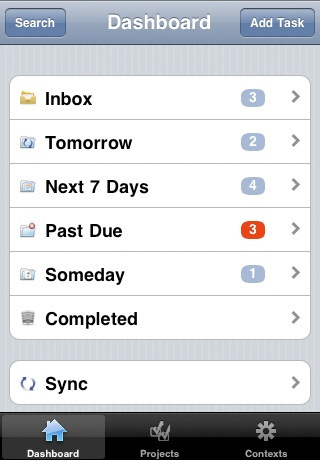 Create lists that show you what is due, overdue and completed. If you are familiar with Evernote, you know that you can use this site to take notes, create lists, search through images and share your documents. This app is seamlessly synchronized across all the devices and platforms you use, including Evernote for Mac, Evernote Web, and Evernote for Windows. No matter if you use a Mac, PC or both, SugarSync allows you to access all of the files on any of your computers without having a single file stored on your iPhone. 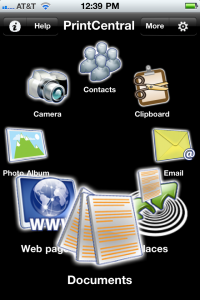 This app works in tandem with SugarSync desktop. 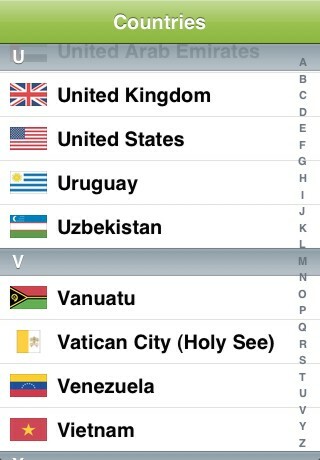 The favorite online dictionary is available now for your iPhone and iPod touch. 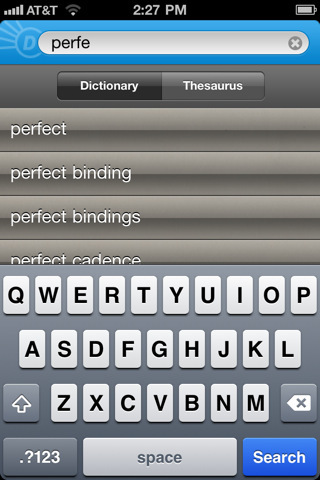 The app takes several minutes to install over a connection; however, once downloaded, you gain access to reference content from Dictionary.com and Thesaurus.com including more than 275,000 definitions and 80,000 synonyms. Create flashcards from notes and share them with friends using any two-column Google Spreadsheet. Use text, images, foreign language characters and more to create sets that can help you learn anything from chemistry to zoology. Save Web pages for offline reading. Great for long articles and blog posts that you find during the day and would like to read, but don’t have the time when you find them. When paired with a free StudyBlue.com account, users can take their notes, flashcards and other study materials with them wherever they go. The ultimate iPhone Thesaurus. Enter any word and get synonyms, antonyms, related words and simliar words. words are linked to definitions from the 1WebApps.com’s Dictionary tool. 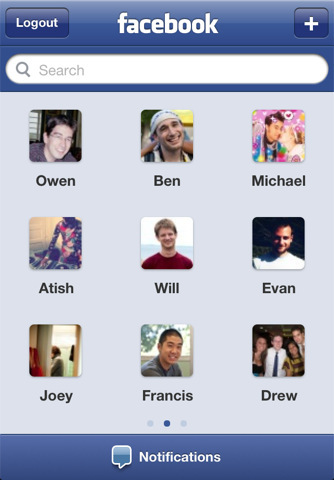 Stay connected with this app, which provides the same functions you find on Facebook on your desktop. Use your iPhone to start a conversation with Facebook Chat, check your friends’ latest photos and status updates, look up a phone number, or upload your own mobile photos to Facebook while on the go. JiWire’s Global FREE Wi-Fi app uses your iPhone’s GPS and network triangulation capabilities to locate free Wi-Fi Internet access anywhere in the world. Get your professional network on now, well before you enter the workforce or start a career. 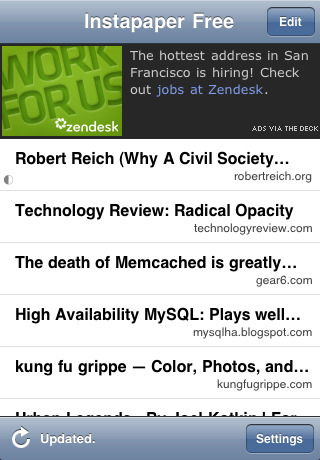 This social networking site can provide you with a safety net and an open door to interviews if you work it right. 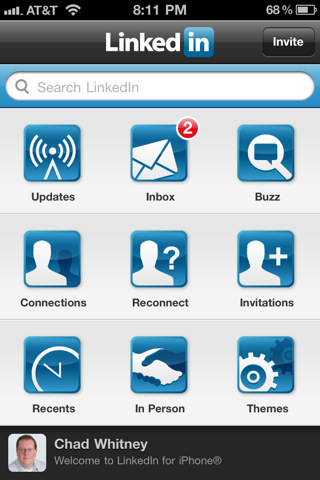 Get the latest updates and messages from your network and keep them up-to-date with your status in real-time. Learn about events near you, including the names on the venues. Get email event alerts tailored to your interests and use the iPhone’s and iPod Touch’s location awareness to locate events near you. Want to relax? Just start with the name of one of your favorite artists, songs or classical composers and Pandora will create a “station” that plays their music and more music like it. 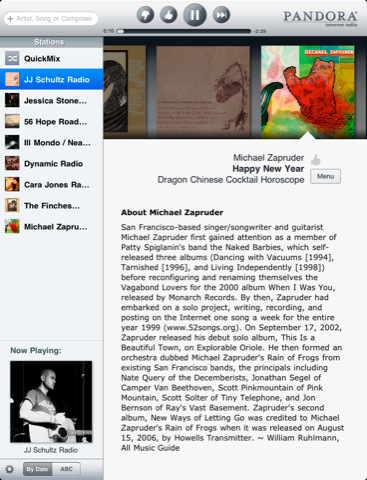 Pandora on the iPhone is fully integrated with Pandora on the Web. 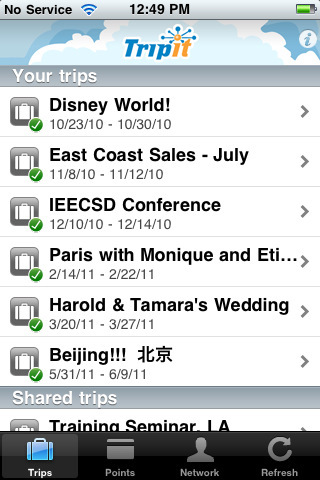 TripIt Travel Organizer puts all your travel plans right on your iPhone no matter where your travel was booked. Share your itinerary with friends, family and colleagues on TripIt, Facebook, Twitter and LinkedIn. With millions of local directory listings and event listings nationwide, you can count on this app to find the most popular businesses, services and events near you or wherever you’re going. 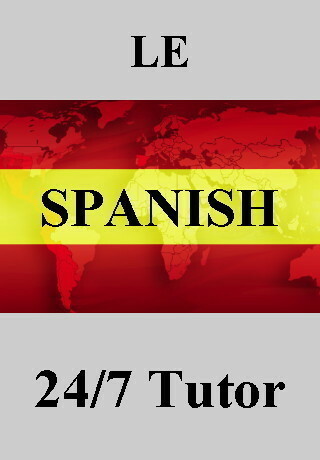 This tutor features native speaker audio, puzzle games, multiple choice quizzes, and more. 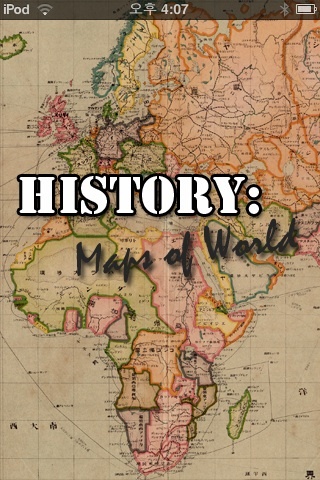 History:Maps of World is a fun and educational collection of high-resolution historical maps. 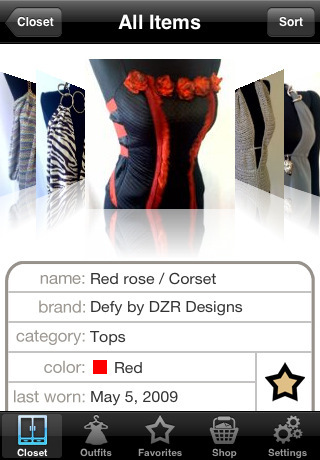 This fun and simple application will display a new word and its meaning everyday. Educational and entertaining, open the application daily to learn something new. 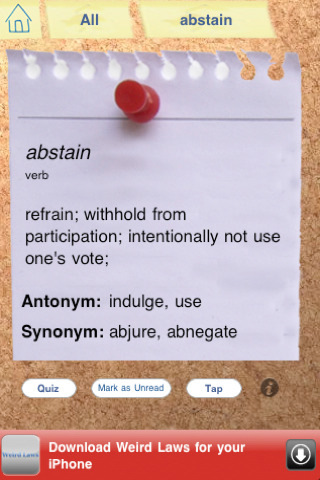 Be sure to check out the full ad-free version of Word of the Day in the App Store today! Note: Even if you change the date on your iPhone, this app will still show info for today’s actual date. The data and today’s date are pulled from a server, so you know you’ll always get today’s info regardless of the date set on your phone. Start improving your French today with this easy to use application. 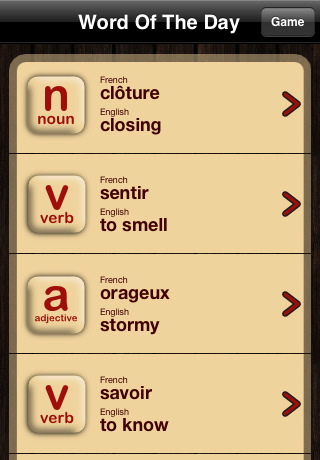 Learn daily with this app to improve your French vocabulary (verbs, nouns, adjectives, adverbs). 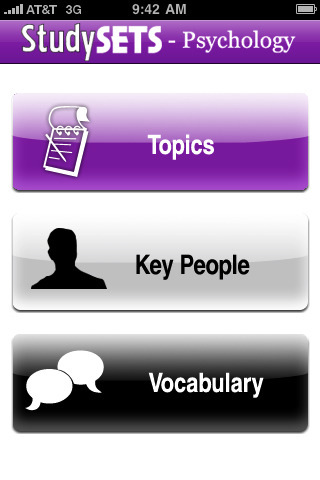 StudySets provides a unique way for studying a variety of subjects directly on your iPhone or iPod Touch! With a variety of topics, ranging from “Conditioning” and “Memory” to “Personality” and “Neuroscience,” along with a directory of common vocabulary and key people, complete with online wikipedia entries, “StudySets Psychology” proves to be an invaluable tool for making learning simple. “StudySets Psychology” is a great companion for all levels of Psychology, including concepts covered on advanced placement tests and college-level exams. With StudySets, you can now listen to music, talk to friends, and study for tomorrow’s test all in one convenient way. 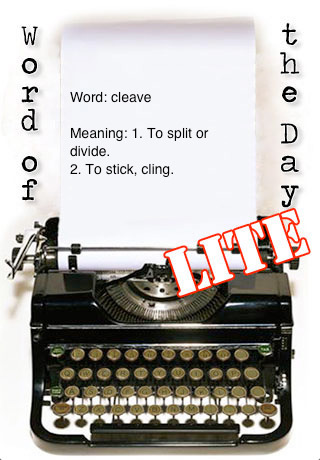 Get a jump start on improving your English vocabulary and proficiency. Master tough words and learn at an amazing speed. 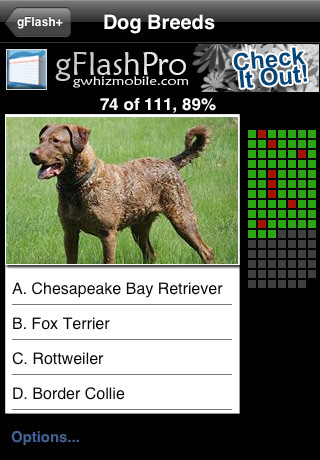 Over 30,000 students and casual enthusiasts have downloaded this app and benefit from it. Whats more, its absolutely FREE! 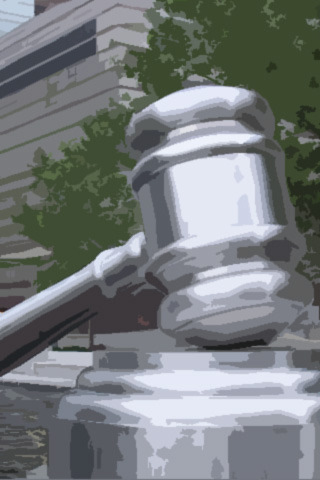 Law and political science students can use this real-life law reference as a study tool, too. 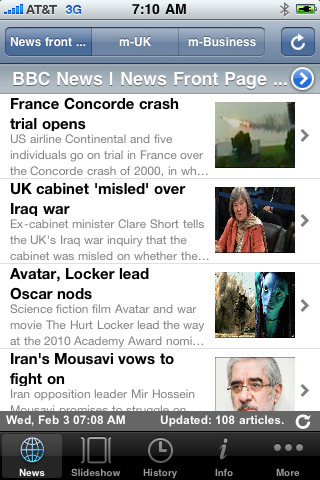 Get the latest and quality news articles and analysis from BBC on your iPhone/iPod Touch. Works even when you don’t have Internet connection or poor 2/3G reception. Browse Nation Public Radio (NPR) content by Program, Series, On-Air Personality, and more. 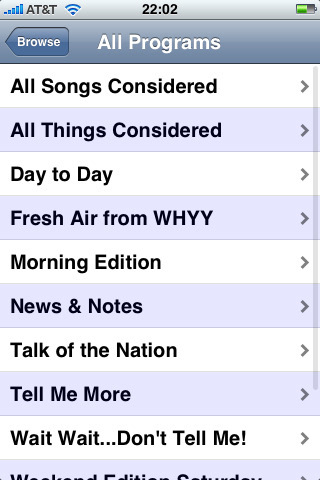 Get your daily news and hourly news updates from the Podcast directory. This application does not stream live content. NPR Addict provides you with an easy-to navigate application interface for finding the program segment you’d like to hear. Stream the radio program, read the available story text and view any available image. 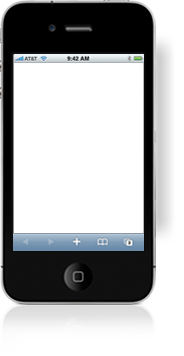 Flashlight uses the LED light on iPhone 4 and fills your screen with bright white light to illuminate your world when you find yourself in a dark spot or concert. 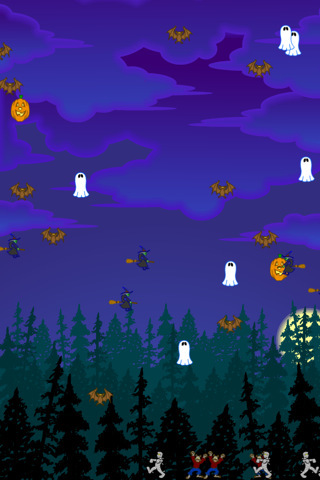 Includes fully customizable special effects including: Strobe Light, Trippy, S.O.S., Yin-Yang, Halloween, Candy Hearts, Holiday Lights and more! Why trust your important game timing to gravity and falling grains of sand? Sand and glass hourglasses are so 14th century. Bring your games into the 21st century and be the envy of everyone at your next game night. It all animates beautifully. Sand piles up, turning on the side to pause makes all the sand pour to the side. 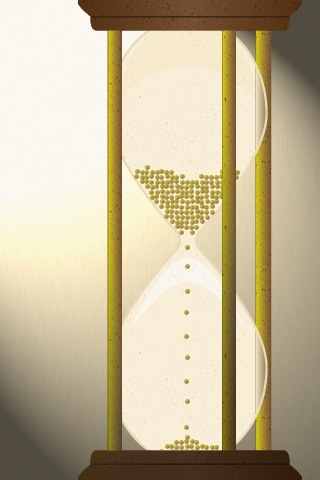 The hourglass instantly resets when you flip it upside down, no more waiting for sand to move to start the next round in a game. Keep your closet organized on your phone by cataloging photos and shopping lists and picking out your party clothes ahead of time even when you’re away from home. 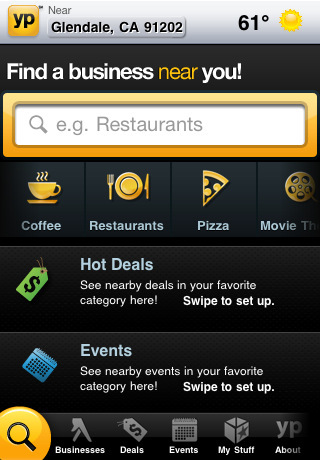 No other location app shows you restaurant deals, menu, reviews, ratings, map and info all on one page. 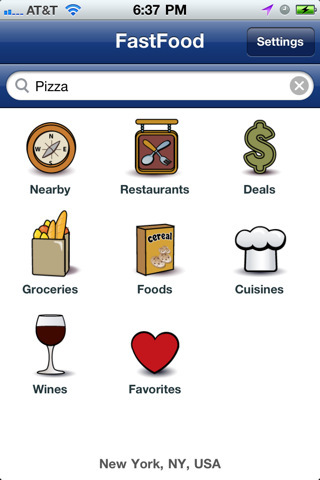 This app will save you money, let you find all kind of restaurants, give you nutritional info, restaurant menu’s, reviews, ratings and deals. 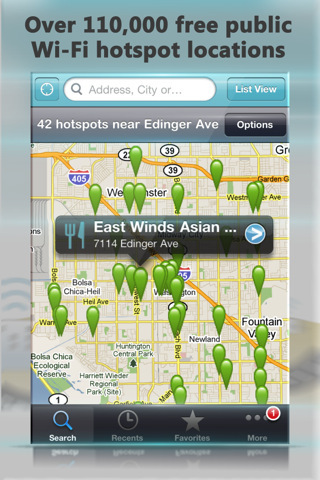 Use FastFood to find restaurants nearest you with a single tap! 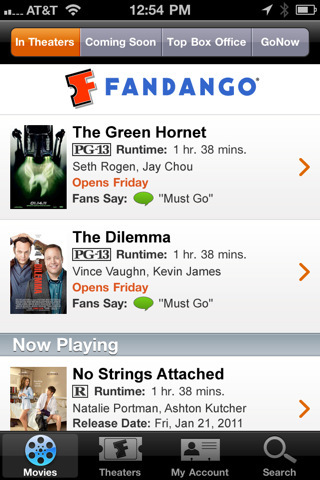 Fandango, the nation’s leading movie ticketing service and one of the Web’s top moviegoer destinations is now available for the iPhone, iPod touch and iPad! Get movie times and theater listings with the flick of your finger. On the iPad, take full advantage of the large multi-touch screen, in any orientation. Watch crisp, full screen movie trailers. Read fan ratings and movie reviews. Buy tickets fast and drama-free. 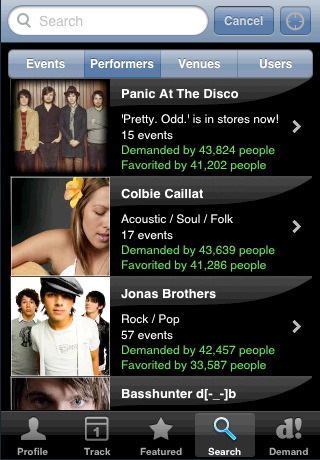 The app is personalized for you using artists in your music library and shows from our global database of concerts and live events. 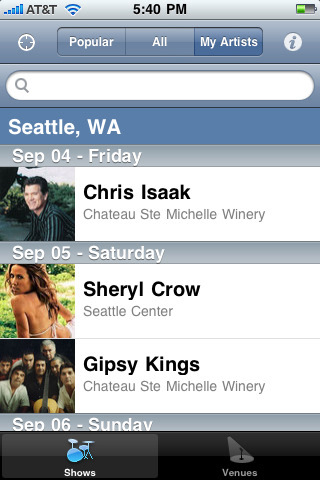 Get notified when your favorite artists announce local shows. And browse nearby concerts by date, or by favorite venue, and access handy links to find tickets online, get directions, or listen to songs posted by the artist. 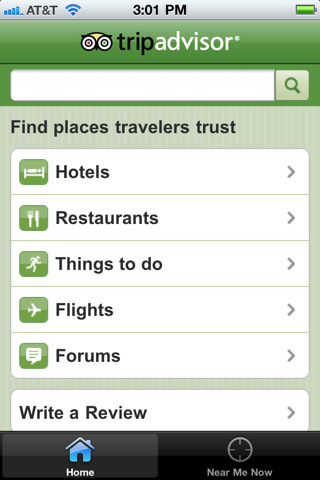 TripAdvisor is now optimized for the iPad, iPhone and iPod touch. Plan and have the perfect trip with access to real traveler reviews, opinions, photos, maps, and forums that can answer even the most specific questions when you’re on the go. TripAdvisor is the world’s most trusted travel site with over 40 million reviews and opinions by travelers like you. Slifter lets you SEARCH over 1 billion products at nearby and online stores; see local HOT DEALS and promotions; get iPhone-exclusive gift guides, save items to a personalized SHOPPING LIST; and SEND finds to friends and family. Use Slifter to compare prices while shopping anywhere at any time. 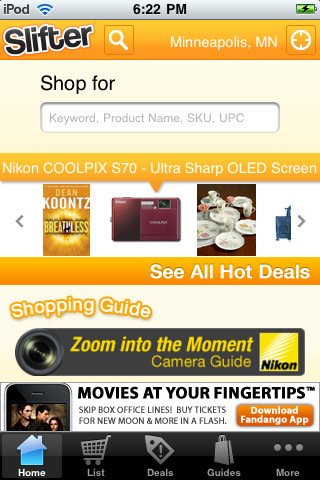 Slifter can help you find that deal, sale, or discount offer to make sure you save. Look up drinking games to play at your next party. I’ve never had so much success in love since using Perfect Date. I consistently hit a home run every date I go out on” Make sure you land that goodnight kiss on your next date by ensuring that you’ve prepared efficiently for anything that may arise! Is your house ready to receive a guest, are you wearing decent underwear, have you turned off the sound of the answering machine before leaving your house? These are all things which you won’t miss by preparing for your next date with Perfect Date. This application gives you detailed information (Flag, Current ruler, Area, Population, Capital, Largest cities, Languages, Ethnicity/race, Religion, Literacy rate, Economy, Government) about all the Countries of the World.